Anytime there is Moon energy afoot big things are sure to happen. But the Moon Mother is always there to watch over us. When the Moon tarot card presents in a reading, it portends of impressions from the highest reaches of the astral world which are likely to come flooding into your conscious mind. The psychic messages of the Moon card defy explanation but cannot be ignored. Sometimes, these impressions manifest in the form of visions and intuitions, but more often they make themselves known as an almost physical pull. Because this path leads us through that “undiscovered country” of the collective subconscious, using the instinctive, intuitive – non-rational – part of our mind, our experiences during this process may seem overwhelming and even frightening, at first. Yes, the road ahead might look a bit scary. Once the crayfish in the Moon tarot takes his first step, he is committed. Crayfish cannot walk backwards. Emerging from the safety of his home waters, he must travel a long, winding road that will take him beyond the horizon – and anything he can even begin to imagine. He must make it past the wolf (our untamed nature) and dog (our more domesticated self) on the Moon card, symbolizing the savage and civilized aspects of his psyche. Once he passes the two towers symbolizing the boundaries of human understanding, he is definitely in outlaw territory. There in the background of the Moon tarot, the road winds through tall mountains, obstacles that must be overcome but lead to higher spiritual awareness. In the Moon tarot, those ominous will-o-wisps could easily lead him astray. Still, the path before you is laid out clearly, and the moon, the divine mind speaking to your subconscious, brightly lights up the landscape before you. When the Moon card rises in a tarot reading, pay attention to what’s happening below the surface. Your higher self is using your subconscious mind to get your attention. You’ve just begun to accept that you’re naturally extremely intuitive and you’ve learned to trust your feelings and gut instincts. You’ll quickly figure out what the universe is trying to tell you. But if you’re a “just the facts” kind of person and feelings are fairly low on your priority list, you may be in for a rough ride. The messages you’re receiving from the universe in the Moon tarot are marked “high priority” and no, they’re not spam. Others may feel that you’ve been in a real mood lately. What mood exactly? To be honest, all of them. Sometimes, they’re taking their turn, and sometimes they’re bursting to the surface all at once. If you ever wondered what it’s like to be happy, sad, confused, and pig-biting mad at the same time, you’re discovering that right now. At this point, your subconscious mind is being flooded with all kinds of new information. This information cannot be processed by rational understanding, so it manifests itself through your senses. All six of them. That’s right, your psychic sense, too. Everyone has psychic abilities, but the extent to which you can develop them depends on your natural talent and determination. It’s a bit like weight training. Anyone can become stronger and more toned by lifting weights. But some people are naturally stronger than others, and weight training may not be everyone’s cup of tea. But there is nothing unnatural about your inborn psychic abilities. Psychic impressions manifest themselves differently to everyone. They can range from a mere inkling or intuition – a feeling about a certain situation, person, or future event – to a full-blown vision complete with sights, sounds, feelings – even smells and flavors. They can happen in your dreams, but they can also happen when you’re fully awake. The more you try to suppress them, the harder they’ll push back. That’s were those moods come from. 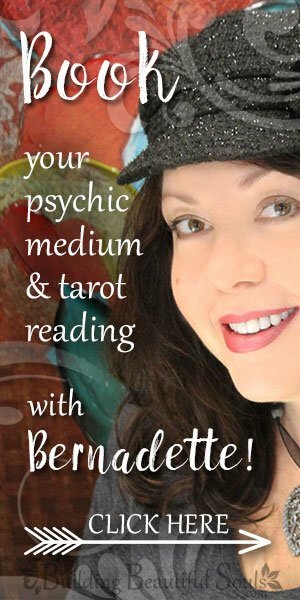 The Moon tarot card announces both, spiritual and physical birth. 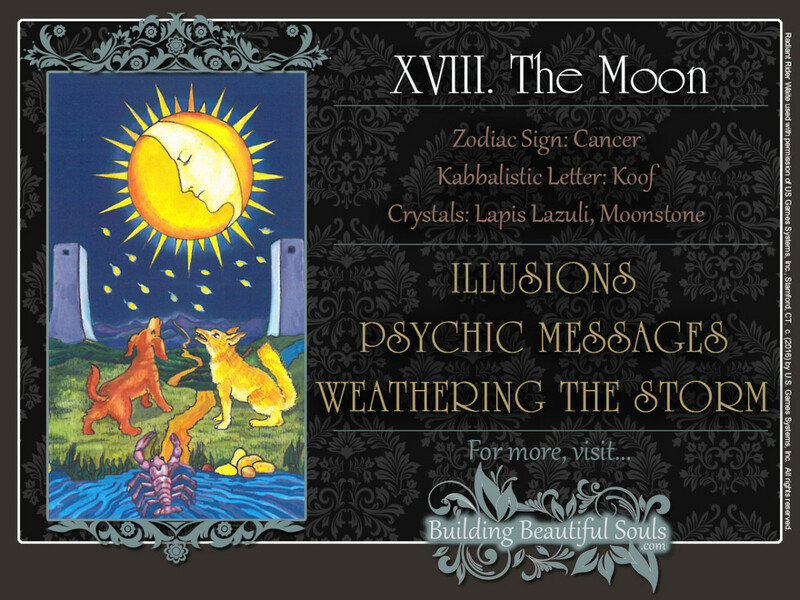 Thus, the traditional fortune telling interpretation, that someone may be expecting, also applies to the Moon card. Birth may also denote a new path being “lit” for you by the Moon tarot card. If where you’re going in life or who you are at your core is not clear to you, if you’re seeking “enlightenment” regarding these questions, the great Moon Mother has appeared in your reading to tell you that the answers are inside you. This is especially true for women as the Moon is a feminine, Goddess energy. All of us have a darkness within, but rest assured The Moon tarot has shown up as a reminder that you are a light being and you can have all you imagine but cautions you to really “see” things as they are rather than through the eyes of fantasy. If the Moon card rises in your reading and is reversed, you’ve been fighting those cosmic tides for quite some time. Chances are, you’re feeling exhausted and burned out by now. Take a step back and reflect on what’s been happening lately. Where do you need to set boundaries, and where do you need to go with the flow? Take a look at what parts of your life you need to change – and what parts can you change. Sometimes, The Moon card shows up in a reading to let you know that you’ve bitten off more than you can chew. With the sometimes overwhelming influx of information from your higher self, a whole new vista of opportunity is in your reach. You need to decide how you’ll focus your energy. With all the new information you’ve received lately, it’s easy to get distracted and stray from the path. There are 15 will-o-wisps in the Moon card, a reference to The Devil, so those distractions can be pretty serious. When reversed, The Moon tarot card may very well point out that you’ve lost your way. Oh, and your friends have probably been telling you that for a while. It’s a good idea to start listening to them. The truth is usually much more obvious than it seems. If you’ve been walking in the shadows, keep in mind that the only light you need to pay attention to is also the biggest and brightest one in the Moon card. And it’s lighting up the entire landscape. Finding your center and returning to your path, to the light, is a lot easier than you think. The Moon card is the eighteenth Major Arcanum. When viewed as 1+8, this number points to new beginnings, but also manifestation: A cube has eight points. Added together, these numbers equal the Number 9, the number of months in the human gestation cycle.